Come step back in time and visit The Old Exchange and Provost Dungeon! Our site offers a variety of education programs for students and groups of all ages. The Old Exchange is rich in Charleston history, and we have created programs that are not only entertaining and informative, but they have been designed to reflect South Carolina Social Studies Academic Standards. Education tours are available during regular business hours (9:00 a.m.-5:00 p.m.) and begin on the hour and half hour. Group rates listed below require a minimum of ten paying guests. To book a date for your group, please review the programs offered below and fill out the Group Tour Registration form to the right. Our staff will review the availability of your requested date and contact you within two business days. Please make your reservations as early as possible. For more information, please call (843) 727-2165 or email us at education@oldexchange.org. For South Carolina education standards, please download this file (PDF). Description: Come learn all about The Old Exchange building's history. This program takes students and guests through all three floors of the Exchange (including the Provost Dungeon), and teaches them about the American Revolution, pirate history, colonial "Charles Town," and the slave trade. Description: A guided tour focused on colonial “Charles Town.” This program teaches students about colonial American life, and includes an interactive program using some of the toys and personal items from the era. Also includes a guided tour of the Provost Dungeon. Description: Students begin with a guided tour of all three floors of The Old Exchange, and then explore local sites associated with President George Washington. Includes a guided tour of the Provost Dungeon, a visit to the Great Hall where Washington was entertained, and a picture scavenger hunt through Charleston's historic district using a detailed map provided by The Old Exchange. Description: Navigate all three floors of The Old Exchange Building on a guided tour focused on pirate history. Then set sail into the city and find locations tied to Charleston’s pirate history. Includes a full tour of the building, and a picture scavenger hunt where guests find pirate-related sites in Charleston's historic district using maps provided by The Old Exchange. Description: Come to the Old Exchange and learn about its role in events leading up to the Civil War. Groups will tour the building and learn about events like the Nullification Crisis, the domestic slave trade, and South Carolina’s secession from the Union. Description: The Old Exchange is able to provide customized specialty tours focused on the historical theme of your choice. Common topics include the Civil War, African American history, and architecture. Please indicate your topics of interest in the comments section. These are programs offered during out-of-school periods, such as summer vacation or Christmas break. They are great for summer camp groups or groups looking for seasonal historic fun! Description: A pirate-focused history tour that takes children through all three floors of The Old Exchange. Includes an interactive component in which students make their own treasure maps and pirate dolls. Also includes a tour of the Provost Dungeon, featuring stories about infamous pirates like Blackbeard, and the "Gentleman Pirate" Stede Bonnet. Description: Come walk in a winter wonderland of history on this special holiday-themed tour of The Old Exchange. Learn about holiday traditions in colonial America, see the Provost Dungeon, and then "deck the Great Hall" as participants make their own pomanders. Offered between November 1st and December 23rd. Have costumed docents bring history to you! These programs are designed to bring the history of South Carolina and The Old Exchange to local Charleston county schools and events. Description: Have a pirate drop anchor at your location! This is a chance to have your group talk with a pirate-costumed docent while learning about Charleston’s pirate history. 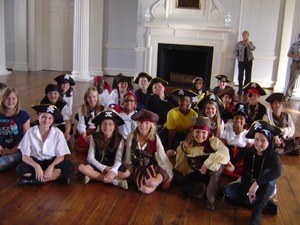 Includes 10 prepared questions the group gets to ask the pirate, and pirate-themed items that the docent will display. Description: A patriot brings freedom to your location! Learn more about Charleston and the American Revolution by having a costumed docent visit your location. Includes 10 prepared questions the group gets to ask the patriot, and items relating to colonial and Revolutionary War history the docent will display. We offer programs that allow groups to visit other famous historic sites in Charleston. These programs allow groups to see not only The Old Exchange, but also places like The Powder Magazine, Heyward-Washington House, and The Old Slave Mart Museum. Description: Travel to the year 1781 in this special multi-site program presented as if students were still in the American Revolution. Students see the Provost Dungeon, where Patriot soldiers joined others in a British prison, and get to visit the Heyward-Washington House and Powder Magazine to learn about other aspects of the British occupation of Charleston. Booking requests for this tour are automatically forwarded to the Powder Magazine. For more information and for SC Social Studies Academic Standards, click here. Description: The Old Exchange offers customized multi-site tours in partnership with other area historic sites, including the Old Slave Mart Museum, the Powder Magazine, and the Heyward-Washington House. Please describe your desired combination in the comments section. Please register your group prior to your visit. If you wish to request a tour or educational program, please submit this form at least three weeks in advance. Our staff will review the availability of your preferred date and contact you within two business days.